Established in Nova Scotia, East Coast Aquatics Inc. is owned by a professional and experienced project manager. We are a biological consulting firm, providing core services of habitat assessment; ecological inventories; habitat restoration / rehabilitation design and implementation; and effectiveness, or environmental effects monitoring. 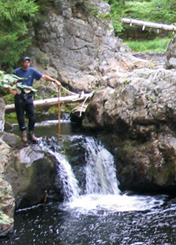 We provide particular specialty services around the freshwater ecosystems of rivers and lakes. We can manage all facets of a project from its infancy in planning to successful implementation in the field, to final monitoring and evaluation. The services we offer are based on current proven practices and methodologies; thereby providing scientific defensibility. © 2006 East Coast Aquatics Inc.